The Stevenson Pop Classic Custom has as a couple interesting features. 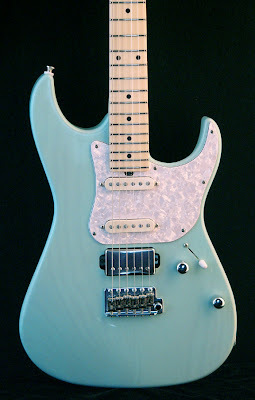 Besides top electronics & hdwr by DiMarzio, Wilkinson & Sperzel, there are only 2 bolts for the neck- however, in the pocket are 2 additional mortise & tenon joint configs- so that neck ain't gonna budge. Does this also enhance resonance? Dunno, but it certainly can't hurt. I'm thinkin' it should. 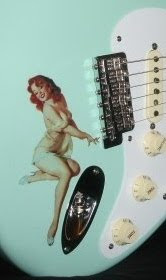 The other cool feature being how they abbreviated the pickguard in order to body mount that bridge humbucker. This is supposed to add midrange definition and punch a la the old EVH approach. Just a guess-- can anyone either confirm or rule this out?? Body options are the standard Swamp Ash or Alder, but just look at the translucence of the finish! That translucent blue kinda reminds me of Downy fabric softener. Maybe it'll remove the static cling from your playing. Just click on the photo or text link for more pics at Stevenson's website.